Access to up-to-date information is a critical component of any disaster recovery programme. First responders, civil engineers, medical professionals, electricians, local and regional officials, media and, of course, the public all need to know which buildings have been damaged, which buildings contain hazardous substances or critical infrastructure, the status of water and wastewater services, which roads are open, where shelter, water and toilet facilities are located and a host of other questions that need answers. 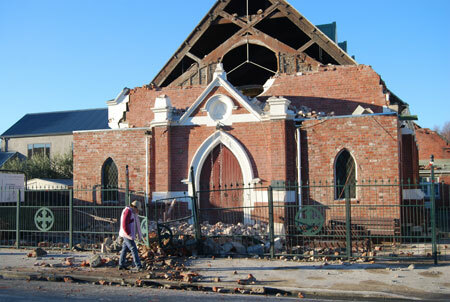 In Canterbury, in the aftermath of the 7.1 magnitude earthquake on 4th September 2010, GIS (geographic information system) provided the answers. “Within 24 hours of the earthquake,” says Iain Campion, Team Leader Information Systems at Environment Canterbury, “we had internal, secure external and public external web-based GIS sites up and running. The internal and secure sites showed areas of damage, emergency call outs, post earthquake satellite and aerial photos as well as other information. “The external secure web site,” continues Campion, “was created for emergency services and government agencies involved in the response, and was set up in such a way that information could be exchanged quickly and securely during the event.” The public-facing web site was extremely well-received…it received more than 6.5 million ‘hits’ within the first three days of the event. Hazardous substances in damaged buildings pose a direct threat to first responders as well as the public. Environment Canterbury’s Hazardous Response Team is usually responsible for containing hazardous substance spills and ensuring the safe disposal of that material. But after the quake, they had another role…to immediately inspect every building containing hazardous substances to check the integrity of the hazardous materials. And, if there were any ruptures, to cordon off the area and secure the spill. But with so many damaged buildings, they needed to know which ones to inspect first. Teams of two working in 24/7 shifts needed to hand digitise critical information from situation reports coming into Regional Civil Defence at Environment Canterbury. Under normal circumstances spatial data exchange would be done through electronic means but unfortunately this method was not always available during the initial days in the event. The local authorities either had their own systems down or staff were occupied fully in supplying their internal resources with information to target areas to be remedied. There was also an incident site made available to the public during the event. This web site enabled the public to view information like damaged services and where cordoned off areas were located. Users could also turn on layers for crowdsourced (ie submitted by the public) information. In the aftermath of a major event, information is critical. And if that information is accurate and accessible, the information becomes invaluable. In Canterbury, after their earthquake, the GIS team proved that today’s technology is up to the challenge, with significant potential to further improve disaster management. Key resource for on-going recovery work.